Last weekend, my mother and I embarked on some St. Patrick's day sewing. Mom made a table runner and I made a dozen coasters of the for leaf clover variety. 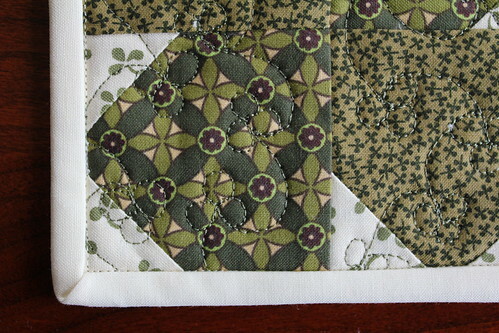 I used four fat quarters for the tops and backing, and Bella Solids jelly roll strips for the binding. 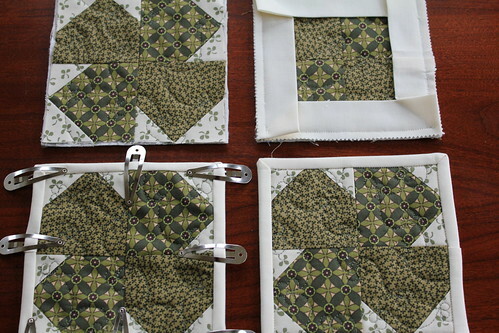 Binding is time consuming work, especially when dealing with 48 corners. I miter the corners and usually miter the binding joints as well however, on small items such as coasters, I finish the binding with a simple, straight joint. 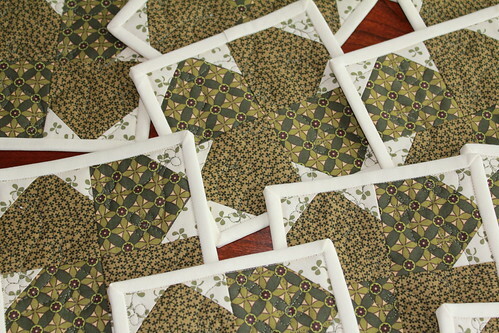 The coasters were quilted using a free motion trefoil design. I think these will look great with a mug of green beer! Fantastic idea, I love it! The quilting is the perfect finish. I’m so happy that you have stopped by. There are so many fantastic quilting bloggers out there who have entertained, taught and amazed me. I hope that Modern Quilting by B provides you with the inspiration that I have so gratefully received from others. If you have a question or need some quilting help, feel free to e-mail me. I'll do whatever I can to assist you. I hope that you enjoy your visit! Modern Quilting by B - Copyright 2013. Simple theme. Powered by Blogger.